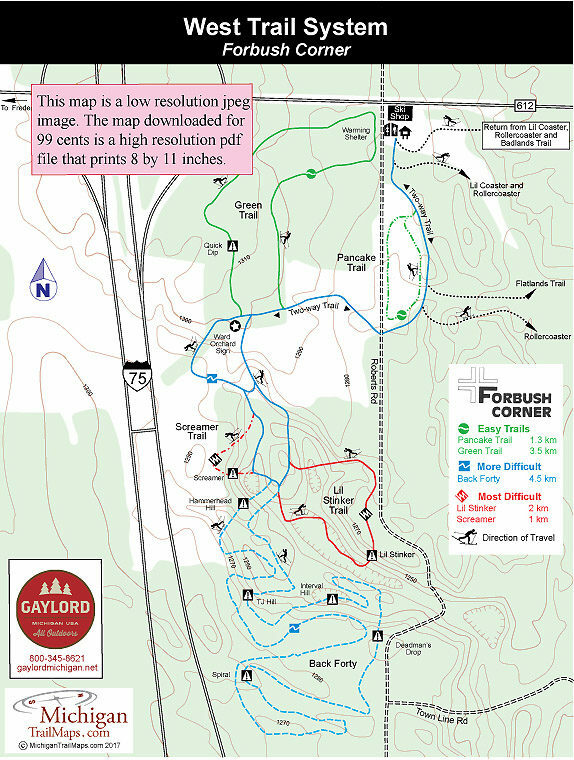 The West Trail System at Forbush Corner lies on the west side of unplowed Roberts Road and is 11.5 kilometers of groomed track divided among five loops ranging from Easy to Most Difficult. The heart of the system is commonly referred to as the West Trail and Back Forty, an 8-km loop that is rated More Difficult and begins at the starting gate near the warming shelter off of County Road 612. Departing from these loops are the system’s Most Difficult loops; Lit Stinker Trail and Screamer Trail. In the northern half of the system is Green Trail, an Easy loop that forms a 3.5-km from the starting gate. The Green Trail is an Easy ski off the West Trail that forms a 3.5-km loop from the warming shelter or a 4.8 if you include the Pancake Trail as well. You begin with the two-way trail and follow signage for the West Trail, passing the start of the Pancake Trail and crossing Roberts Road. Green Trail is posted on the west side of the road and followed in a counter clockwise direction. Most the trail is in a hardwood forest. Within a kilometer you emerge at Roberts Road and can spot the ski shop on the other side before looping back to the south. Just before reaching the junction with West Trail, you reach one of the highest points at Forbush Corner at 1,310 feet and enjoy a gentle downhill run known as Quick Dip. These two trails combine to form one of the longest runs at Nordic center, an 8-km ski that includes five major hills but is rated More Difficult overall. You begin at the starting gate with the two-way trail that leads pass junctions with Lil Coaster, Pancake Trail and Rollercoaster and then swing west to cross Roberts Road and pass the junctions with Green Trail. The West Trail then forms a 1.5-km loop that is skied in a counter clockwise direction and passes junctions with Screamer Trail, Lil Stinker Trail and Back Forty at its south end. Back Forty is a 4.5-km loop that includes Hammerhead Hill, a difficult climb encountered early, and Deadman's Drop, a challenging downhill. These sections are rated Most Difficult but advanced intermediate skiers should be able to handle them. Back Forty returns to the West Trail loop where Lil Stinker begins. This 1-km side trail is rated Most Difficult and followed in a counter clockwise direction from the West Trail loop. It’s basically a steep climb of almost 40 feet in elevation and then a “screaming downhill” back to the West Trail. Lil Stinker is a 2-km side trail from the West Trail Loop that is rated Most Difficult and followed in a counter clockwise direction. The hill known as Lil Stinker is a long climb reached halfway through the loop. 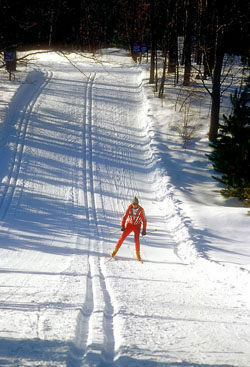 Near the end skiers will enjoy a long descent followed by a steep climb to the junction with the West Trail. Facilities at Forbush Corner includes a ski shop, two warming areas with restrooms and showers, a full ski and snowshoe rental service, Nordic lessons and on the weekends limited food service. The ski season at Forbush Corner is often late November to mid-March when the Nordic center is open weekends and holidays and the week between Christmas and New Years. Hours are 10 am until dark. 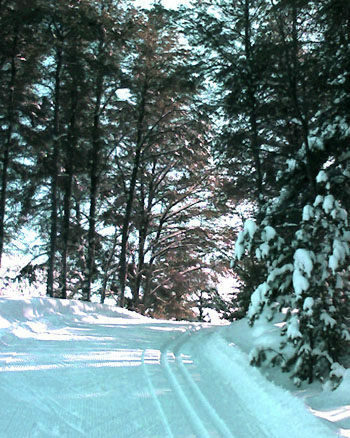 A trail fee is charged and a release must be signed before skiing. Forbush Corner is north of Grayling, a quarter mile east of I-75 from exit 264 at 4971 County Road 612. Contact Forbush Corner (989-348-5989; www.forbushcorner.com).